I wanted to find a stamp of a famous French person and the first one I came across (because I don't have many French stamps) was this 2014 Marguerite Duras issued on the 100th anniversary of her birth. She died in Paris in 1996, but was born in Saigon. I didn't know much about her, except that she wrote "The Lover", of which I've seen the movie but not read the book. She was already 70 years of age when she wrote that book. She had also written many plays, films, novels, essays, reviews, interviews, and screenplays. The Lover is now known to be highly fictionalized although when it was first published she claimed it to be completely autobiographical. From a NYT article, Truth, in the Durasian universe, is a slippery entity. After "The Lover," Duras said, in Le Nouvel Observateur, that the story of her life did not exist. Only the novel of a life was real, not historical facts. "It's in the imaginative memory of time that it is rendered into life." After having spent a good portion of the morning reading about her life, I don't think I much like her. And apparently, she both awed and angered the French. She was an alcoholic, a Communist and a Résistance fighter and by many accounts she was also a vain, provocative and difficult woman. 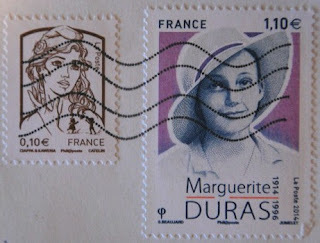 As for the stamps, the Duras stamp was designed by Sophie Beaujard and engraved by Claude Jumelet. The Marianne stamp has been a definitive in varying forms since 1944. This is a 2012 version designed by David Kawena and Oliver Ciappa and according to abelard.org she is based on comic strip and manga drawings. The image is based on Inna Shevchenko, an activist and leader of the feminist group Femen, though previous images have been based on actresses such as Brigitte Bardot, Mirielle Mathieu and Catherine Deneuve. Two feisty women, well three if you count Marianne in as well. I thought about including a Marianne stamp as well but did not know enough about the ones I had. Glad we managed to find a French connection this week. Interesting stamps and intiguing stories. I like the modern version of Marianne's stamp for having its roots in comic strips and manga. That's unusual for stamps, I think!?! (I love comics stamps :-) ). I should read about Marguerite Dumas, I didn't know her so far. When such a succesful person is difficult, vain and /or alcoholic, I wonder what made this person being so. Lack of love, craving for confirmation, or what would it be? Time for me to read her books! (if ever I have time..), so thank you for increasing my curiosity!